Following are issues that may occur when working with page layouts in Flare. This issue may be caused by having a page layout set on a TOC entry (which is at a lower level than the target and project) that is overriding the page layouts set at higher levels. Page layouts set closer to content override settings further away from the content. Remove the page layout set on the TOC entry. To accomplish this, perform the following steps. In the local toolbar, click . The Properties dialog opens. Select the Printed Output tab. In the Page Layout field, select Default. 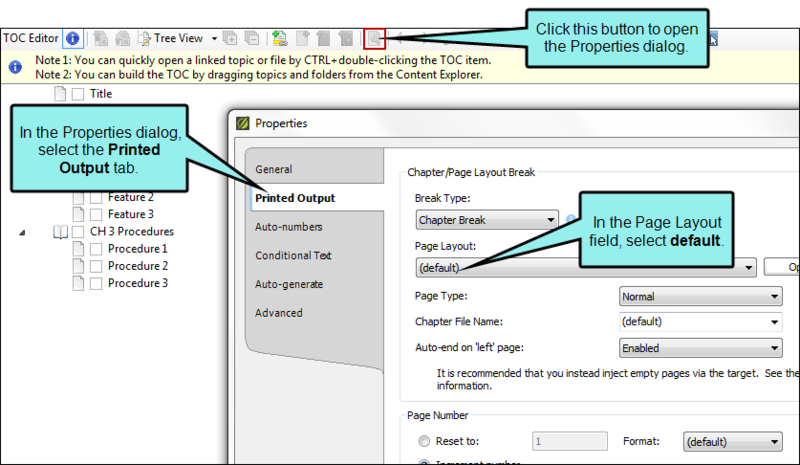 The page layout set on the TOC level will be removed, allowing the page layout set at the target or project level to be used. See About Page Layouts.